How do you get a picture of the two of you when there's no one else around? 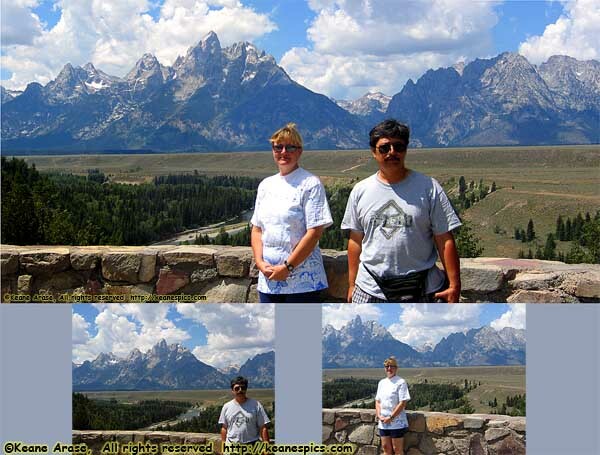 Do a Stupid Photoshop Trick! I called this section Imaging because I couldn't figure out what else to call it. It's a list (or history) of the equipment used to capture the images on this site. If we look at the tech of photography today as compared to say, 25 years ago, virtually nothing is the same beyond being able to record different wavelengths of visible light, and the physics of the optics that channels that light to the size and plane of the recording medium. More simply put, in the days of film, a lens was put in front of a light-proof box, and had an analog recording medium (film) that had three layers of light and color sensitive chemicals. Film had to be chemically developed before being viewed, and the final delivery was something physical, be it paper prints or slides. Today, a camera is a lens in front of a computer. The lens is placed in front of an electronic sensor. This sensor has a number of pixels (picture elements) in a grid each composed of red, blue and green light collectors. A central processing unit interprets how much light of each color reaches each pixel, and records that information to a memory card. (If saving to a picture format, such as JPEG, the CPU translates that pixel information into a standard file format, applying corrections for the lens, as well as sharpening and color balancing the image. The final delivery could be some sort of physical medium, but more often than not, it becomes just an image on a computer monitor. I suppose the approach to either types of photography is the same from the end-user perspective, even though the way the images are captured has undergone a radical change on how they are captured. Some things are true today as they were with film, such as a better lens will produce a sharper image (though with today's precision machinery and computer aided designs, even relatively inexpensive cameras can produce very good images); a larger sensor (or film format), will produce better image quality. The last film camera I used was a Nikon F3, primarily using a Nikkor 35-70mm and Vivitar Series 1 70-210mm zooms. I have around 10 lenses, all Nikkor, such as a 300mm, 105mm (one of the sharpest lenses Nikon produced), a normal f1.4 50mm, the 55mm Macro, but still tended to use the two zooms as my primary lenses. My flash units were almost always Vivitar, though I used an intelligent Nikon unit specifically designed for the F-Series later. I put thousands of exposures on that camera over its 20+ year life, and represents about 75% of the 35mm scans on this site. The remainder of the other film-sourced images on this site come from a couple of 35mm point-and-shoots that I kept in my car for emergencies, those "Wish I had a camera" moments and the "If I dump the canoe, I'd rather not have the Nikon go down with the ship" moments. There are also a good number of 35mm negative scans taken with Jo's Canon AE-1 during the early road trips. I had a back bedroom converted into a darkroom. I didn't make my developers from scratch, but I did still develop all my own black and white film, and even had pretty good success with E-36 (Ektachrome) and C-22 (Kodacolor negative). I had three print enlargers (a quick and dirty 35mm only, a very good multiple format and a dedicated color enlarger), and could do some pretty decent prints up to 11x14. However, the process (mostly for color) had two major problems. One, it had to be done in total darkness, and second, the analog chemical process had exacting temperature requirements, and often used toxic chemicals. Serious changes happened in 2000, when an HP Photosmart S20 negative scanner was introduced, and I converted all my 35mm images to digital files. The 3600x2400px files it produced was 22.5MB each. Multiply that by 5,000 scans, and it's about 120GB. While that sounds tiny today, back then you couldn't create a disk partition larger than 137GB, you could only get two disks on an IDE channel (so more disks meant using a slot for another IDE controller, and slots were important because you didn't have USB, firewire or e-sata), and disks were still multiple dollars per gigabyte. So a compromise was made to keep the better pictures at 2400ppi, but resize less important pictures to 1800x1200px which created a 6.4MB file. The total size now was about 32GB, which is miniscule today, but needed 50 (650MB) CD's to back up. Tape backup was also available, but was prohibitively expensive. It was all good for a few years. But then large scale photo printers became available, and I had no way of making a large print from any of my negative scans. (The largest print you can derive from a 1800x1200 pixel image is about 9" x 6".) Disk storage became much less expensive, machines became faster, and the software became more capable, so there weren't any barriers to keeping large images around. So a decision was made to do something about it, and I called it the Great Rescan Project. I also found some color imbalance. I think some of the dyes in the consumer negative film I was using faded, making me wonder what all those Kodacolor-X negatives from the 1960's and 70's look like now. Finally, I would just like to point out that all of my pre-digital photo equipment, cameras, lenses, flash units, exposure meters, enlargers... They're all worthless. Relics of a by-gone era. Perhaps they'll be worth something as curiosities 100 years from now. Canon's 2312x1720 pixel G2 image quality could make a very respectable 8" x 10" print on the current day printers. It didn't quite reach the optimal 300 ppi, but came close if you didn't crop the image. Instant verification of a shot. I've had hardware problems before (the Nikon lost flash sync once during an important shoot, and I didn't know it until the negatives were developed), and the ability to instantly review a shot was a tremendous plus. It's also nice to be able to review and back up your images every night. A preview screen not only allowed you to adjust the exposure and see the result in real time, but swiveled allowing you to frame your shot without having to look through a viewfinder. (Handy when taking pictures close to the ground, or above crowds in front of you.) This allowed you to see the resulting image immediately, before you even took the shot. While memory cards were still rather expensive, their cost versus film and developing decreased every time you reused the card. A memory card (that held the equivalent of 8 rolls of 35mm 24-exposure film) and a spare battery was the size of a single roll of film. If you've never had to keep track 25 to 30 rolls of film, I can tell you, it's not easy. Exif data was stored with every single image file which contained an accurate date/time stamp (if I remembered to set it), and even included exposure and flash information. Merging together images from more than one camera became simple by just sorting on the date/time. Because of the small size of the "film" (that is, the CCD sensor), the zoom on the camera was the equivalent of the two I'd used on the Nikon, yet the G2 was smaller and lighter than the Nikon without a lens. So in 2002, I officially traded film for a computer. Since then, I have exclusively used Canon PowerShot G series cameras. I have absolutely no need to carry an SLR anymore. Jo bought a G5 in 2003 to replace her Canon AE-1, and it was pretty much a 5MP version of the G2, with a better processor. But it was still 5MP over 4MP camera, which was a little more forgiving when making prints, so it was the primary camera when we took trips together. It came with all the same positives as the G2, but also the same negatives. They both had horrible on/off and lag times. (Lag time was the time between when you pressed the shutter button and the camera decided to take the picture.) There was also the problem of waiting for the camera to store the picture on the slow memory cards of the day. The PowerShot G7 (10MP) was my next camera, a true upgrade with a fast processor, minimal on/off times (with a built in lens protector) and an almost non-existent lag time. It had a much larger preview screen, but it was non-movable and the camera only shot in JPEG. Because of these limitations, it was the least used camera before being replaced. But it was the first post-digital camera (that I owned) to have surpassed film's capability. If you really needed the dynamic range, you could shoot an exposure bracket and create an HDR image. The PowerShot G9 (12MP) brought back raw image files and a swivel screen, and was purchased the month it came out in 2008. It was used two years. Bypassing two interim models that had limited enhancements, I next purchased a G12 (10MP, 1/1.7" (7.44 x 5.48mm) sensor) in October of 2010, and in two years put 10,000 exposures on the camera. The G12's new processor and software did a very good job of sorting out all the problems of photography, like correct white balance and exposure, an amazing hybrid of optical and digital stabilization, though it did need to be prodded for correct focus once in a while. It also took respectable 1080i video, if you didn't ask too much of it. Two years after the purchase of the G12, the camera I waited for since I switched to digital arrived, the Canon G1X. (14MP, 1.5" (18.7x14mm) sensor.) A large sensor meant low noise at high ISO, with exceptional image quality, all in a package slightly larger than the regular G series. It has the same ergonomics and interface of the G12, so there wasn't even a learning curve. Heh. Since I treasure image quality about all else, this is a dream camera. It is my current camera, with the G12 serving as backup and close macro cam. I also have a Sony Handycam HDR-HC9 1080i mini-DV camcorder for long lens video work, but the G1X (1080p) video function has mostly replaced it. I have a rock-solid, heavy duty Slik tripod, which can hold a heavy SLR with a long lens. I don't use it anymore. The G cameras or the HC-9 on such a tripod just looks ridiculous. My primary tripod is a Slik Insta-Lok 500G-FL, a very lightweight aluminum model. Fully collapsed, it's half the length of a baseball bat, and about as thick around. It has tilt and pan adjustment, and ranges from 17" (fully collapsed, but legs fully open) to 46" fully extended, and weighs in at under 1.5 pounds. It probably won't handle the weight of a heavy SLR with a long lens or a pro-camcorder, but for a digicam or consumer videocam, it works great. I also use a Manfrotto MM394 monopod with a Cambo ball head for tilt and pan. The tilt and pan is mostly used for video, but when you have to brace the monopod against a bench or something for a long photo exposure, the head will let you level the camera. With the head, the monopod is 23" collapsed, 64 inches fully extended, and weighs in a less than 1.5 pounds. From there I moved to an Epson 960, because it could do panoramic prints, something HP lacked. After the 960 broke, I moved to an Epson R1800, which could do 13" panoramics. To be fair, my workhorse/everyday printer is an HP, but use Epson for photo quality prints. My general picture database is ThumbsPlus. I have a lifetime license, so I saw no need to go to Lightroom. They provide Canon Raw converters, so my entire picture tree can be correctly imaged. All post processing is done in Adobe Production Premium CS5. (Including the 64-bit versions of Premier and Photoshop.) I've always edited in Photoshop (from version 4 or 5) even before I ever thought of going digital at all. And I've always used Premier since 2000, whatever version that was. A light version came on the Sony Vaio laptop I bought at the time and learned it on that, and have used it ever since. I only upgrade about every other version. The development machine these run on is the latest quad core i7 (well, maybe not by the time you're reading this) running Win 7, and along with the 64-bit versions allows things like rendering preview video in real time. There's even a noticeable improvement working on large Photoshop (.psb) images.